he town of Chiquián is tucked away in a little valley at 11,000 ft. altitude (3350 meters) in the mountains of Perú, two and half hours from Huaráz or any other bigger town. 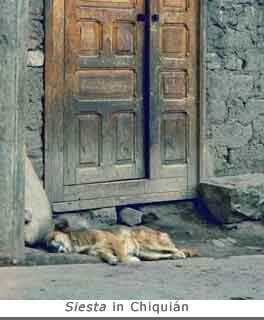 It exactly fit my preconceived idea of the perfect little Andean town in which to get to know Andean life. It's hard to say how many people live in Chiquián. The town itself is about ten blocks long by ten blocks wide. I've read population figures ranging from 1000 to 6500. After having walked every street and alley in all of Chiquián many times, I know there aren't 6500 people there. My estimate is about 2000 if you count the outlying shacks that are within range of the town's electrical and water supplies. There are three or four clusters of houses each a few kilometers from Chiquián, but they are considered separate pueblos with their own individual traditional dress styles and different patron saints. Chiquián has an official Spanish-language website (http://www.chiquian.com/), but it is hosted in and managed in the United States. The town of Chiquián itself lacks the resources to manage its own website. I know that there are at least two computers in the town of Chiquián. One is in the biggest, tallest, most expensive hotel in town ($5/night for a room with a shared bath). That computer was unplugged and covered with a sheet for the time I was in town. I also heard of another computer at the town's high school, which sometimes can connect to the Internet through the phone system, and sometimes not. A lot of tourists come through Chiquián. They arrive and leave by bus or van, but you don't see them. The buses and vans pull up to the front door of a hostel where the gringos unload all their expensive equipment and disappear into the hostel like roaches scurrying for cover under the furniture. Sometimes at night a small group of gringos will venture outside their hostel to eat at a nearby restaurant. Before daylight the next morning the gringos are off on a long trek with guides, horses, porters, and enough burros to carry all of their gringo luxuries. That constant flow of tourists was nearly invisible to most of the town of Chiquián. The inflow of cash helped the economy of the town overall, but the individual mommas washing clothes in the river didn't always notice a difference. I spent a week in Chiquián. Every day I would walk every street in town in the morning, then again in the afternoon. At night I would stroll around most of the town once again to enjoy the unique festive character of Chiquián after dark. I saw no other gringos walking the streets while I was there. Some of the town's storekeepers and a few old-timers who also walked the streets for exercise became acquainted with me, the only gringo who stayed in town and talked and listened. Many shopkeepers and residents had an extra friendly "buenos días" for me each day. I was a novelty for them. I wish I could capture the mood of the town at night. After the businesses closed and after the work of the day was done, the people of Chiquián came out at night to socialize. Merchant carts were set up at the intersections of the cobblestone calles where they sold everything from candy bars to freshly butchered and cooked chicken. At the town plaza, young couples strolled hand in hand, old men sat in benches watching the crowds, friends and families played, laughed, talked, and generally enjoyed life. Here, where so many of the people had few material possessions, they had each other. They were rich, and every night was a celebration. I asked one of the citizens why I never saw any police. She explained that the town had no police force. 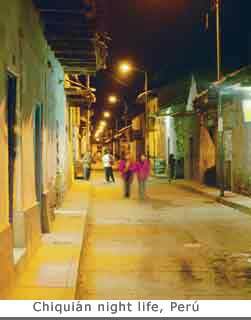 Unlike other cities in Perú that had police and armed guards at every street corner, the whole town of Chiquián had none. If anything ever required police intervention, the citizens would write a description of the problem and give it to one of the van or bus drivers to deliver to a nearby town. If necessary, a policeman would be dispatched to Chiquián to look into the matter. Tourist trekkers might spend $50 to $100 a day for guides, animals, and gear. I'm afraid that I only spent $5 a night for a room and less than that each day for food. I might not have contributed a lot of cash to the town's economy, but I think the town and I gave something to each other. When I left the town, I left with handshakes and hugs and friendships. Can you put a price on that? n my first morning in the little Peruvian town of Chiquián, I stopped at a little shop that sold a few office supplies. I asked the young clerk if there was a Spanish teacher in town who I could hire to tutor me. She started to shake her head, "No," but then thought of something. "One moment, please," and she darted out the door to shout some questions to someone across the street. The clerk turned to me and said something about a gringa who lived nearby and something about German and English. I couldn't understand all the details because, well, because that's why I needed a Spanish tutor. The clerk started to give me directions to the teacher's house, but then decided it was much simpler to take me there herself. "La Gringa," as they called her in town, lived a few blocks away. She would be my Spanish tutor for the next week. And what an interesting tutor! The locals called her La Gringa, because the was the only gringo who lived permanently in town. Uta was originally from Germany, but many years ago settled in the little Andean town of Chiquián and married a Quichuan man. Uta was a powerfully built middle-aged woman, about the size of three Quichuan women put together. She spoke German, learned Quichuan from her husband, and also spoke a bit of English. With an academic background from years ago in East Germany, she was recognized in town as a teacher, even though she was employed as such only informally in her own home. Uta and her family lived in a three-story adobe house in Chiquián. It was a typical casa complex with a central courtyard open to the sky. The lowest level had a kitchen and wood stove for cooking. The topmost level was mainly the roof with a little awning over it. There Uta raised chickens. A small room was set aside on the second level as a classroom, with a whiteboard, small table, a few chairs, and an electric light. Her family was lucky, she explained, because they could afford electricity. Although electrical service was theoretically available to every house in Chiquián, only about half the households could pay for any electrical use. Their family used electricity sparingly: most rooms had candles for light. The classroom's electrical light was an exception. They could not afford a clothes-washing machine or the electricity to operate it, so Uta regularly washed the family's clothes in the river. I enjoyed my daily lesson with Uta. 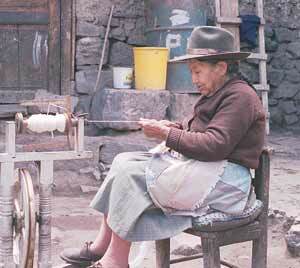 She taught me not only how Spanish was used in the village, but also customs and stories about the local way of life. During one afternoon Uta strolled with me through the narrow streets of the town. "Just a moment," she said. "My husband has some family who lives in this house. Maybe they will let you take some pictures here." Uta disappeared into the adobe house for a few minutes, then returned and said, "Come on in, they said they wouldn't mind if you took some pictures." 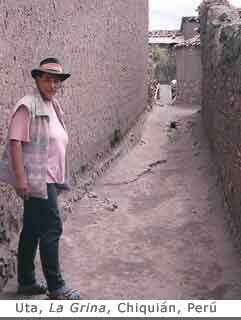 Uta led me into an adobe complex where lived a small Quichuan family. Uta introduced me to a delightful old woman who smiled a nearly toothless smile at the only other gringo she had seen in a while other than Uta. The old woman moved her spinning wheel into the open part of the courtyard and began to spin wool yarn so that I could see the process in action. Another woman in the house showed me her kitchen, where she spent most of her time every day. In a little wooden shack with no light other than from the wood fire, pots were cooking something that smelled good. Chickens and guinea pigs ran around in the kitchen. To get the guinea pigs to come out from under the stove, the woman threw some fresh greens on the kitchen floor. I tried to get a flash picture of the guinea pigs that in a few weeks would be somebody's dinner. Guinea pigs, called cuy in the Quichuan language, are food in many parts of Ecuador and Perú. The only cuy I tasted while in South America was prepared in a little restaurant, and tasted all right. It appeared to be most of an entire small guinea pig. The poor critter had been so well marinated before roasting that I couldn't tell exactly what the meat tasted like, but it probably tasted like chicken.